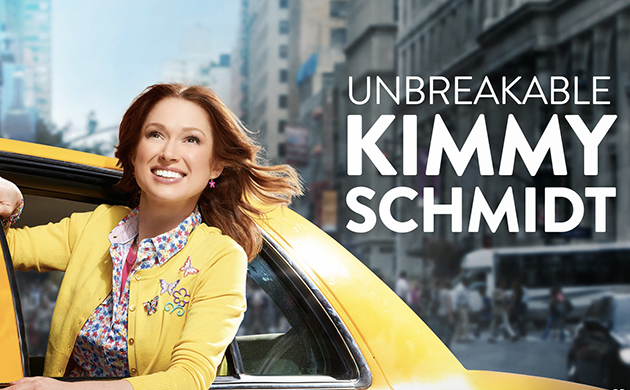 Witness The Unbreakable Kimmy Schmidt! Are you feeling down that both 30 Rock and Parks and Rec are off the air? Well Netflix has a series for you, the Unbreakable Kimmy Schmidt. It is written and produced by Tiny Fey and stars Ellie Kemper of The Office fame. It is zany and fun, and a great addition to Netflix’s library of original shows. The premise is that Kimmy Schmidt (Ellie Kemper) was locked underground in a doomsday bunker with four other women by a crazy cult leader. She has now emerged fifteen years later determined to make a life for herself in New York City despite only having almost an eighth grade education, and no idea how the world has changed in the fifteen years since she was abducted. It is a dark concept to be sure, but they use it perfectly. It gives Kemper the opportunity to act like a middle school student, and to be totally mystified by the culture and technology of today. She often refers to the current day as “The Future”. This show is completely nuts, and I am guessing that is because of Tiny Fey. Her fingerprints are all over Unbreakable Kimmy Schmidt. The randomness of 30 Rock are alive and well here. Kemper is spot on as the lead. She pulls off the childlike woman struggling to make it in the big city with such gusto and charm it is hard not to smile while watching. She is not alone. Half of the cast of 30 Rock is in, or shows up in this show, and just like on 30 Rock they are great. Especially Jane Krakowski who plays Jacqueline Voorhees the wealthy socialite who employs Kimmy as a nanny. She is so delightfully crazy, you never know what she is going to say or do. The only downfall I have for the Unbreakable Kimmy Schmidt is that there are only thirteen episodes, and at twenty-two minutes a piece it doesn’t take long to watch the entire thing. At least they have already picked up the show for a second season, and I can’t wait for them to release it. Netflix has been on a roll lately, I hope they can keep it up. Previous PostPrevious Downton Survives Another Year! Next PostNext Getting Dusty With The Road Warrior!